Upgrade to the Super Saver ticket and enjoy all special exhibitions, giant screen films in 2D or 3D, and the Hayden Planetarium! 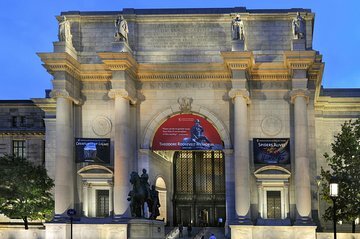 The American Museum of Natural History, located across from Central Park in New York City, is one of the largest museums in the world. It’s also one of the world’s most important scientific and cultural institutions, with more than 32 million specimens and artifacts. With a general admission ticket, enjoy the many current and permanent exhibits and scientific collections. 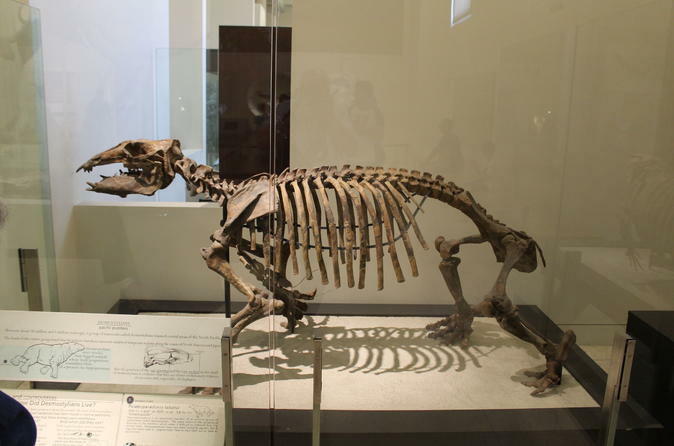 Some of the almost 50 permanent exhibits feature human origins and culture, mammals, dinosaur fossils, Earth and the other planets, plus biodiversity and the environment. See the iconic Tyrannosaurus Rex skeleton and Easter Island head that inspired characters in the blockbuster film Night at the Museum. (Check out the film’s self-guided tour.) Visit the Margaret Mead Hall of Pacific Peoples, the Hall of Human Origins, the Rose Center for Earth and Space and the Big Bang Theater. A Super Saver upgrade includes access to the Hayden Planetarium Space Show, a giant screen film in 3D or 2D and any special exhibitions. See Itinerary below for a sample of exhibits. Since its opening in 1936, the hall has been considered one of the world's great museum displays with 28 dioramas in this hall depicting some of the many animals and habitats of Africa. All the animals have been reconstructed with such scientific accuracy and detail that they appear astoundingly lifelike. It was named after Carl Akeley (1864-1926), the explorer, conservationist, taxidermist, sculptor, and photographer who conceived of, designed, and collected for this hall. Opened in 2007, it is the first major exhibition to present, side by side, the mutually reinforcing evidence of the fossil record and cutting-edge DNA research. The hall covers millions of years of human history, from the emergence of our earliest ancestors through the evolution of our own species. It presents a fascinating mix of fossils, film, interactive media, life-size tableaux, ancient artifacts, and more. Newly renovated, the hall is now a 29,000 square-foot (2,694 square meters) fully immersive marine environment with high definition video projections, interactive computer stations, and eight new ocean habitat displays. Be dwarfed by the celebrated 94-foot (28.6 m) blue whale, one of the Museum's star attractions, floats in a "virtual ocean" created through dramatic lighting, video and sound effects. The Andros Coral Reef, a two level diorama containing 40 tons (36 metric tonnes) of coral, allows a unique view of this ecosystem above and below the water. The newest and largest dinosaur in the permanent collection. The latest must-see exhibit at the Museum: The largest dinosaur ever discovered, a cast of a 122-foot-long titanosaur. We get to know our world through some or all of our senses—sight, smell, hearing, touch, and taste—but they’re just parts of a much larger puzzle. The highly experiential exhibition Our Senses delves into how our brains work with sensory organs to shape our perceptions and reveals how, until recently in our evolutionary history, humans have been oblivious to nature’s other crucial signals, including UV light, infrared sounds, and electrical fields. Oceans explores our blue planet’s defining feature—the world ocean—as revealed through 21st-century technology. Visitors to the exhibition will meet the elusive giants of the sea, including whales, sharks, giant squid; sink beneath the waves in a virtual submersible theater; and marvel at the vivid fluorescence displayed by marine creatures but invisible to us . . . until now. And they’ll leave with a deeper awareness that the future of the planet depends on the future of the ocean. This exhibition, an annual favorite, features up to 500 live, free-flying tropical butterflies from the Americas, Africa, and Asia. The butterflies are housed in a vivarium that approximates their natural habitat, includes live flowering plants that serve as nectar sources, and features controlled artificial light, temperature, and humidity. Celebrate the pivotal discoveries that have led us to greater knowledge of the structure and history of the universe and our place in it—and to new frontiers for exploration. Audiences enter a wild world of breathtaking beauty and captivating animals, including an array of nature’s master of mimicry. This giant-screen film explores the extraordinary journey of 19th century. Naturalist and explorer Henry Walter Bates. This exhibition will focus on the on the genus of dinosaurs known as tyrannosaurs. The exhibition will explore how these mega-predators came to be, with an emphasis on the most famous and impressive member of the family, Tyrannosaurus rex. We had a great time! So much to see! The Guggenheim Museum is wonderful, and this is not why I am rating it only 2 stars. It states, Skip the Line Access, when you purchase the Vouchers. We were not able to skip the lines. We had to stand in line, like everyone else, to get the tickets, as these are Vouchers only, and the tickets still need to be issued by the museum. We had the same situation at Guggenheim. Museum was just so amazing!! Would recommend that the museum have a sign that we need to turn in our vouchers for a ticket, and must stand in line for that. Arrive early as the ticket you receive from Viator is only a voucher and you have to join the ticket office queue. Very busy with very loud school children - otherwise excellent. This is one of my fav museums in the city for kids. The museum is great and beyond expectations. Definitely a must visit for anyone visiting new york but the stupidest thing is that you buy online ticket visa viator to get past the huge lines but we have to wait more than an hour to again exchange the voucher for a ticket which is beyond stupid and I never faced this type of thing while with viator when booking anything in Europe so! The trip was wonderful and well balanced with all the activities. It was well worth my afternoon visit and I learned a lot.